Get ready for cold and flu season with Oscillo and Chestal! "Oscillo has been shown in clinical studies to help reduce both the severity and the duration of flu-like symptoms, helping you feel like yourself again. In one recent study published in a British scientific journal, nearly 63 percent of patients who took Oscillo within 24 hours of the onset of symptoms showed a “clear improvement” or “complete resolution” in as fast as 48 hours. Oscillo has no side effects and is packaged in individual doses, so it’s easy to carry with you and take as you need it. It’s sweet-tasting, melt-away pellets dissolve quickly under the tongue and require no water, chewing, or swallowing, and it’s safe for ages two and up. Uses: Temporarily relieves flu-like symptoms such as body aches, headache, fever, chills, and fatigue. Take Oscillo at the first sign of flu-like symptoms"
"Children's Chestal Honey is safe cough syrup for children ages two and above. The honey in Children's Chestal coats and soothes the throat, while the blend of safe homeopathic medicines loosens chest congestion, thereby making coughs more productive for a speedier recovery. In the daytime, Children's Chestal works without drowsy side effects. At bedtime, it calms those dry, fitful coughs that prevent sleep. It is also dye-free and works naturally with your body. Uses: temporarily relieves cough and throat irritation." Be the first to know about cold and flu outbreaks in your area before they strike in your home. Just enter your zip code in Boiron’s Cold and Flu Tracker at http://www.oscillo.com/flu-tracker to find out your region’s risk level. What we thought: We are huge fans of Oscillo:) I first started using it way back before I had kiddos. At the first sign of a cold I would take the Oscillo and it really helped stave off sickness. After I had kids, I was excited to learn that Oscillo had a children's variety and have used it with my little ones for a few years now. Its great since it has no side effects and works quickly and it doesn't hurt that it tastes good:) That makes it a lot easier to dispense than other not so tasty medicines we've tried. This was our first experience with Chestal. We got to put it to good use when A got a cold last month. When she gets sick with a cough, it seems to last FOREVER! She has been known to have coughing fits so bad she gets sick and it usually happens while she is asleep. 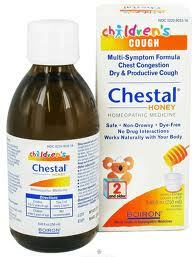 So when she came down with a cough and the OTC cold medicine didn't seem to be helping, we tried Chestal. She loved the taste...she said it tasted like honey and made her throat feel better immediately. I tasted it myself and it was surprisingly good! Her coughing stopped within the hour and she was able to fall asleep and stay asleep which was great for the whole house:) We are definitely believers in the power of Oscillo and Chestal! Both will be staples in our medicine cabinet from now on! ABCD Diaries gives Oscillo and Chestal an A+! Buy It: Oscillo and Children’s Chestal are available at Walgreens, CVS, Whole Foods and local health food stores. Learn more about Oscillo at www.oscillo.com and Children’s Chestal at www.childrenschestal.com. “Like” the Oscillo Facebook page for great tips about staying healthy during cold and flu season, as well as fun giveaways at www.facebook.com/oscillo. "Enter our "How Do You Say Oscillococcinum Sweepstakes!" In January, we'll be selecting 10 random winners to receive free products and a $50 Walgreens retail gift card. Plus, watch our fun new video of people trying to say Oscillococcinum. If you are one of our random prize winners and also guess which fan says it correctly, you’ll be eligible for a bonus $100 Walgreens retail gift card! That’s triple the prize! Enter the sweeps until 1/20/12 here: http://promoshq.wildfireapp.com/website/6/contests/180373"
odd thing - I click to FB like this page and it's fine but then after like 3 seconds it goes back to me not yet liking it. I click, it changes and then resets. Thing is I claimed the entry and just as it went to done I caught that it had reset. After several attempts to fix ... I still don't know if I officially show as FB liking this post or not.